Sky Blues still in hunt for Europe AND battle against relegation! Ballymena United manager Glenn Ferguson (right) and assistant Lee Doherty. Picture: Press Eye. 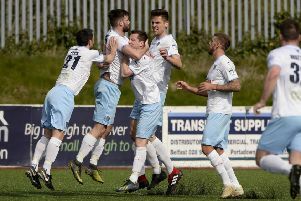 Ballymena United continue their Danske Bank Premiership campaign this weekend - in the remarkable position of having one eye on possible European qualification and the other on the battle to avoid relegation! United’s recent slump has allowed the teams below them to close the gap. Yet the Sky Blues remain just two points behind Portadown in the race for seventh place which this year earns a place in a play-off for a European spot with the sides between fourth and seventh. The Sky Blues entertain Dungannon Swifts this Saturday (3pm) and assistant manager Lee Doherty says: “I know we’re looking to get into Europe by this seventh spot and we’re still in and around there, but we’ve got to make sure we start winning games otherwise we’ll be dragged into a dogfight. “Dungannon are now only two points behind us so it’s a big game this weekend. “Looking at where we are in the table, Warrenpoint have gone on a good run, Dungannon have gone on a good run, the gap which was maybe eight, 10 points and looked comfortable, is now two, four six behind but if we win this week, we’re looking forward again. “Portadown look as if they’ll be the other team in the bottom six where everybody plays each other and that’s where if you win two or three games you’re going to escape that relegation. “We’re still looking for that seventh spot to give us a shot at getting into Europe because the only way we’re going to improve this team is by improving the finances by getting into Europe,” added Doherty. Manager Glenn Ferguson must decide whether to recall leading goalscorer David Cushley, who was left out of last week’s defeat at Glentoran. “David hasn’t been performing as well as he’s capable of in recent weeks,” says Doherty. Even from the Shield semi-final against Larne when he got us into the Shield final he really hasn’t performed and Glenn is the one who knows him probably better than anybody else. “He just felt it was time for him to step out last week and give someone else a chance. “He’ll be frustrated and disappointed but we hope we’ll get some sort of reaction out of him. “David is not the sort of person who will say ‘I’m now a Crusaders player so I’ll not give my best’ - he always does give his best but the quality hasn’t just been there with him in recent weeks. “He is one of our top players and I know that once he gets back into the team he’ll finish the season strongly,” added Doherty. * Paramount BUSC holds its monthly table quiz this Friday night in Ballymena Bowling Club (8.30pm).